This is the highest mountain on theisland of Shikoku. The best approach is from the north, Expressway 11 runs south of Matsuyama eastward passing south of Saijo. Locate Hwy. 142 and take this south. Continue on Hwy. 12. This road will eventually take you up a narrow, deep valley with tall and steep hillsides. The road will run directly to the base parking for a pretty big rope-way that serves the lower part of this mountain. You turn left (into a building), pay parking (500 Yen in 2016) is just below as you exit the building. This location is N33.80322, E133.14999, elevation about 450 meter. Walk up a flight of steps and follow a paved road that curves and very shortly get you to the lower station of the gondola rope-way. This rope-way seems to run from around 0800 in the morning to 1700, in the summer season, with departures every 20 minutes. The rope-way carries you steeply up the forested hillside to its top station located at N33.79541, E133.13336, elevation about 1280 meter. From the top station, follow a broad path that heads uphill, bending a bit left to gain the slope that connects to a Shrine, called Joju-sha Shrine. This is shrine is part of the larger Ishizuchi) Shrine, the most famous part being the shrine near the summit of Ishizuchi, called the Sancho-sha Shrine. There is a small, forested summit just uphill from Joju-sha Shrine, it counts as an independent hill since the subsequent drop to the saddle connecting to Ishizuchi exceeds 100 meter. This location is only about 15 minutes from the beginning of this ascent. Walk through the open space between the buildings of Joju-sha, turn left and exit through the gate. The trail now descends to a nice, connecting ridge in order to begin the true ascent of Ishizuchi. The trail consists mainly of well made steps as the trail zig-zags up the steep hillside. This route is famous for steep sections where huge iron chains are used for protection. The first one is meant for practice, it ascends a small, isolated pinnacle. One must use the chain also to descend on the upper side, the descent is much shorter so the effort is not wasted. The trail bypass this part by going left, then descending a bit before the uphill resumes. Higher up, there are 3 chain sections, each section may be bypassed by taking a trail to the right. The upper (bypass) trails have metal sections and metal stairs. 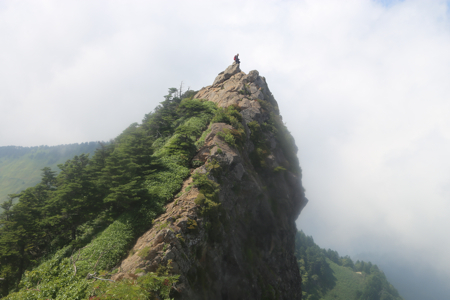 The route tops out on the narrow summit ridge of Ishizuchi. The famosy shrine is located here, but also some shops that mainly target the climbers/tourists. The true summit of this mountain lies a bit further along the ridge. This short, final section is (YDS) class 2+. First, descend to the left, protected by a chain. Next, scramble along the ridge, there are alternative routes below on the right hand side. The first summit seems to be designated as the official summit. However, the next summit seems almost exactly of the same elevation. One should really visit both. We started the hike from the top of the rope-way at 1130. A nice hike along a very well maintained trail. The chains were interesting, really huge dimensions. We climbed a couple and skipped a couple, just for variation. The summit crest with the shrine reached at 1315, one hour and 45 minutes. We continued after a brief stop along the ridge to visit the two summit points along this entertaining ridge. The drop on the left is very impressive. The two summit points are very similar in elevation. We spent about one hour up on this ridge before starting back down closer to 1415. The descent was nice and easy, we walked by the small bonus hill near Joju-sha on our way back, returning to the top station of the rope-way in 1:20.